This Sheridan Beaded Nickel Plated Dresser set is an excellent quality 3-piece set that features a handled mirror, a brush with soft off-white bristles and a comb. 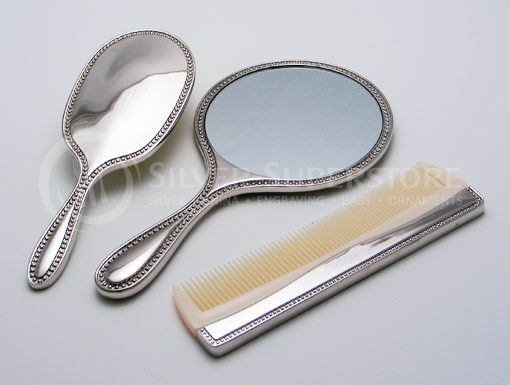 This set has a beaded border design which allows for room for a personized engraving on the mirror and brush, making an excellent gift for that special woman. This set is made of a non-tarnish bright nickel plated finish. 9" long x 4 3/4" wide. 7 3/4" long x 2 3/4" wide with 1" bristles. 7 1/4" long x 2".